My Dog Sunday starts with a young Londoner trying to get a dog from the famous Dogs’ Home in Battersea, which gets stray dogs re-homed rather than “put down”. But it’s not that easy… he does end up with a new and very shaggy friend though. I’m afraid you are too young,” said the lady firmly, and that was that. Ben had to leave the Dog’s Home without any dog at all, not even an imaginary one like Kathy had. He didn’t even look at Kathy, he felt so bad. They just trudged off to the park – Ben, Kathy, and little Jimmy and no dog – same as always but more miserable because now they had nothing to look forward to. 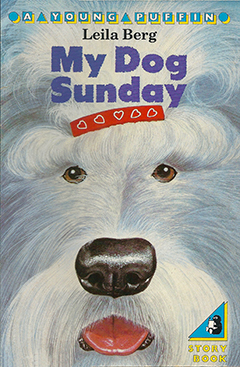 My Dog Sunday was also published in paperback as a Young Puffin by Penguin in 1979, with illustrations by Peter Edwards. Leila’s family had a gorgeous and much-loved Old English Sheepdog called Fred, living with them for years at the house on Streatham Common.